SORT YOUR EQUIPMENT BY COLOR FOR IDEAL CLASS MANAGEMENT! Students will instantly know which equipment belongs to their group by the color of the basket. 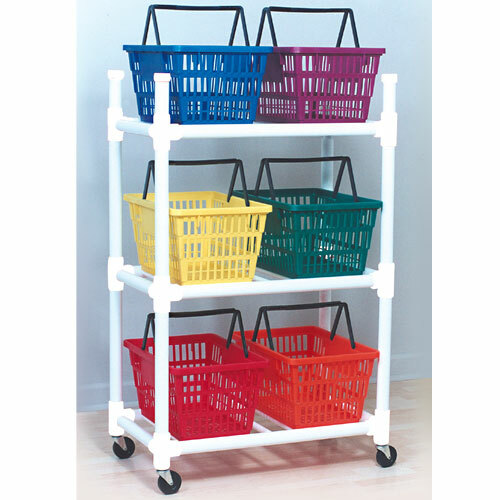 Each basket measures 19-1/4"L x 13-1/4"W x 10"H and features sturdy molded handles for easy removal and storing. Empty baskets can even be used as targets for beanbags, flying discs and balls because the handles fold out of the way. The heavy-duty, locking, swivel casters with 3" diameter non-marring rubber wheels provide easy rolling and secures the cart in place. PVC cart will pass through any standard doorway. Quick and easy assembly. Cart measures 33"L x 19"W x 52"H.